These holiday Coconut Truffles are a not only a mouthwatering DYI Christmas gift idea, they’re exclusively made to please everyone! Take good note of this coconut truffles recipe, it may easily become your dessert saver during these holidays. Deliciously rich coconut flavor combines with indulging white chocolate, for a sweet treat really hard to resist. 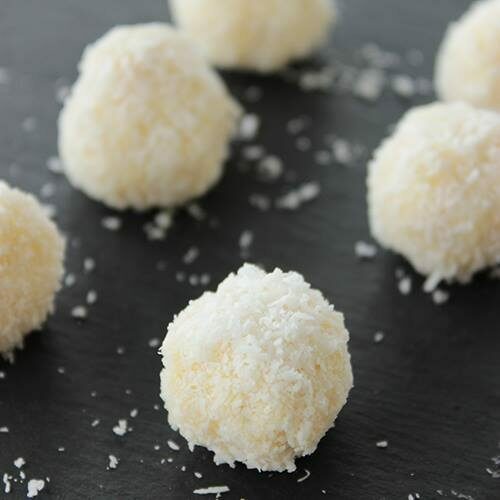 These Coconut truffles are absolutely 100% vegan, dairy free and gluten free, making them one of the most easy-peasy desserts in the world. Simple to do at home, the main ingredients are coconut milk cream, delicious roasted hazelnuts and diary-free white chocolate ( or normal one if you don’t need to make them lactose-free). All you have to do is combine all the ingredients together, roll them into tiny balls and coat with extra coconut. You can also prepare nice little bags and make out of these Coconut Truffles a delicious DYI Christmas gift idea, no more worries about allergies or dietary constrictions. So, coconut lovers out there, that’s the recipe you were looking for! And if you fancy more vegan/ diary free/ gluten free chocolate truffles, go quickly to check out this incredible recipe. – You can thank me later. A guilt-free sweet treat perfect for the festive season. Make cute DYI Christmas gift with these truffles, your loved ones are guaranteed to fall in love with them! Melt chocolate over bain marie at low heat. Stir continuously until the chocolate is almost melted. Remove from the heat and pour into a bowl, add ½ cup of coconut flakes, vanilla extract, almond flour and coconut milk cream. Mix well until combined, if too runny add coconut flakes until you have a medium-set mixture. Put in the freezer for 10 min until set. Divide the mixture and roll into small balls, adding a hazelnut inside. Pour remaining coconut flakes onto a plate. Roll each ball into coconut and refrigerate until set, about 1 h.
Store in the fridge until ready to serve. Enjoy!